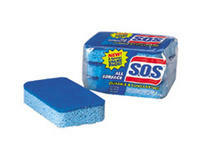 SOS Sponges (3 Pack). Great for all surfaces. Light Blue Sponge and Dark Blue Scrubber. Clorox product.